TECNOMAR NADARA 35 FLY R.B. The Tecnomar Nadara 35 Fly Raised Bridge is the evolution of the 35 Fly presented two years ago by the Tuscany based shipyard. The new version went to satisfy the constructor's need to renew the project and that of the owner who really wanted an entirely custom built solution for his new Nadara. The 35 Raised Bridge indeed offers a renewed stern area design, an original intermediate bridge hosting the wheelhouse and a subdivision of the interiors completely re-designed to ensure greater privacy to the guest areas. The lower deck offers two well distinct areas with separate access to the bridge soberly finished with modern furnishings. The first area which practically runs along the full length of the deck, comprises an owner's suite a- stern, complete with sofa, two desks, walk-in wardrobe and en- suite bathroom, a further two double guest cabins and two twins all supplied with bathrooms en-suite; whereas the crew's quarters are placed in the bow area. They are made up of four cabins of which two are fitted with bunk beds, one is destined for the Captain's use and includes a queen size bed and lastly a single, all have en-suite bathrooms. The fly deck benefits from the relocation of the wheelhouse up to the half deck above, thereby leaving more available space for the common and service areas. A 'full beam' galley can be found in the bows replacing the bridge area, whereas walking towards the stern we're met with the dining area followed by an adjacent area to relax in, a gaming room, and finally the saloon comprising a large C shaped sofa with a table to port, and by a multimedia cabinet on the opposite side. 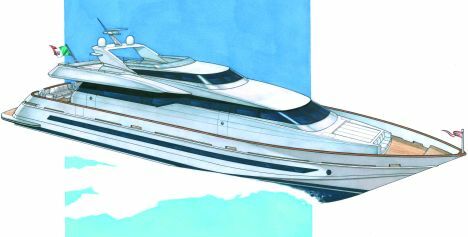 The external cockpit offers ample space for both dining in the open or quay-side parties. The upper half- bridge is assigned to the wheel and all its navigational instruments are duplicated on the fly deck which hosts, wheel apart, a comfortable seating area in the sun and a "C" shaped sofa and relative table. Two tenders and their winches fill the remaining stern area space.